Rakhi Kankaria, the genesis of this celebrations journey is the Director of Rachnoutsav Events Pvt Ltd. She is the execution and administration brain behind the inception and the growing acceptance of Rachnoutsav in the marketplace today as a full spectrum Events Company. She is the energy flowing through the company and is responsible for the meticulous quality that Rachnoutsav offers. Rachnoutsav Academy was founded in 2011. The academy believes in igniting the young minds of the event industry with the rich exposure and expertise that the mentors hold. In conversation with Eventaa, Here’s what Rakhi Kankaria has to say about the importance of industry-specific education. Eventaa: What were the thoughts that led to the creation of Rachnoutsav Academy? RK: “I have been in the Event industry for the past 20 years.” It has been such a challenging yet exciting journey, and I have enjoyed every moment of it. During my time as an Event Manager, I have seen the industry grow exponentially and rapidly. But if there was one thing I saw missing, it was the dearth of trained professionals in the field of event management. After all my achievements and conquests in life, I decided that it was time to give back to the industry, the industry that changed my life for the better. We believe that Event Education is important for each and every other individual who may even belong to some other field, simply because events are a part of our everyday life. It helps in the wholesome growth and development of every individual and equips them with necessary organizing skills important in any work environment. This was the idea that led to the creation of Rachnoutsav Academy in the year 2011. Eventaa: Since its inception in 2011, how do you think the academy has grown over the years and how does it fall apart when compared to other event institutes and academies? RK: Rachnoutsav Academy has grown multifold since its inception in 2011. From offering 2 courses during its first year, we now offer 9 different courses related to Events and Event Management. We now have 140 full-time students here on our campus. Our “Professional Foundation Course in Event Management” is the first of its kind to be offered in South Asia. When you ask how Rachnoutsav falls apart, and I’d proudly say it is a level above the others too, it’s because we have a practical related approach where students work on various events during their course and students are exposed to a lot of field work and interact with current industry professionals. We make them meet the Rock Stars of our Industry! Venue Recce (at venues that are not open to the general public), Market surveys and mock setups form a major portion of their course along with theory. We are also affiliated with the Govt. of Telangana. Our course is recognized by S.I.V.E (State Institute of Vocational Education). This is the difference between our Event Course and any other Event Course taught by any other institution. Eventaa: How is the academy contributing towards the growing event industry? RK: Our students are trained in such a way that they are ready to directly enter the industry without any other training required. They are the first-of-their-kind professionals in an industry which previously lacked any formal education. We encourage more and more individuals to join our industry to bridge the gap between demand and supply. Through such professional training, we are also bringing in a more professional approach to the entire industry itself which was previously more unorganised. Eventaa: What are your future goals and aspirations with regard to the academy? RK: I believe that Event Education will soon become a mainstream field of education and that event education must become a part of every student’s curriculum in their schooling. We strive towards making this dream come true. Rachnoutsav Academy is a pioneer in the field of formal event education and I see it growing into one of the top most professional institutes in the country. 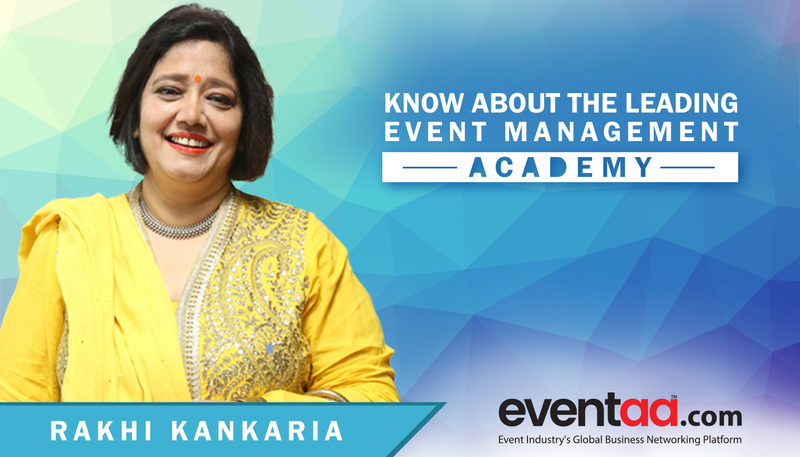 Eventaa: What qualities according to you are required to become a good event manager? RK: I think event management is a very different job compared to most other industries. Things like fixed timings, desk jobs, monotony, Job descriptions and routine don’t come into the picture at all. Creativity, flair, hard work, patience, professionalism, people skills, enthusiasm, desire and leadership define the qualities of any event manager. Any event manager knows that the only way to be successful is when you’re passionate about your work. Eventaa: What would be the best advice you would give to someone who is thinking about pursuing Event Management? RK: Event Management is a field that is fuelled by passions and emotions and is meant for perfectionists. It is meant for people who love interacting with other people. It’s a growing field that needs hardworking people with a hint of flair. It’s a field that’s growing more and more every day and that this is the right time to become an event manager, if there was ever a better one! You are welcome to join Rachnoutsav Academy and we will further help you achieve your dreams and goals!